I signed up on Twitter days ago (see side bar) but I find I'm using it to rant or rave about tv shows because I love tv. If you like to follow me, please do. Just a warning though, I do rant a lot. If it's your favorite show, I'm apologizing in advance for hurting your feelings but I won't apologize for seeing it the way I see it and saying it out loud. 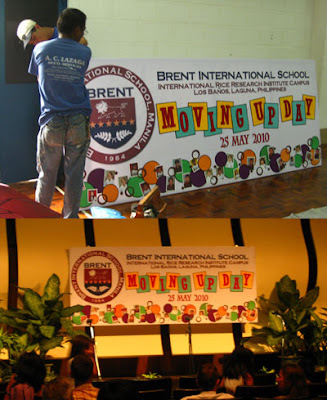 Yesterday was the kids' last day in school and of course, their Moving Up Ceremony. I did that background signboard or whatever you call it. The logo and the header are printed in large format. Then, the tarpaulin was stapled to a wooden frame without a plywood skin so it's lighter and easier to transport and haul up those undulating panels. We wanted it to be reusable so I decided that the other elements are paper cutouts in primary and secondary colors. Many thanks to IRRI's carpentry for making us that frame and helping us attach it behind the panels. As to what the stage looks like... well. Until now, I'm still bad at arranging plant stuff. So I just framed the background with plants like so. And IRRI lent us a truckload of plants! I didn't know what I'd do with them so the others I just lined on the floor in front of the stage. In person, the whole front including the stage actually looks like a rain forest. LOL! 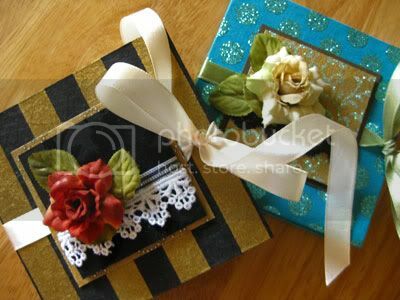 Here are two mini-albums I'm shipping today for a friend. I'm still finishing four other minis, two of which are identical. I really do enjoy doing these small things. It's like doing scale models again. I know! Isn't it pathetic? Remember my New Year's resolution about me creating a 2010 scrapbook? Well, I'm finally finished with my March double-page spread and starting with April pages. I also did the album on this one I think I'll be able to post this in January of next year. I found that if I'm creating for myself, I tend to make it very simple. There are usually lots of frilly embellishments when I do scrapbook for others but here, it's not the case. But as always, there are a lot of photos in a page. I can't do just one photo. I tried, but I really can't. Then there are the birthday photos of my niece, Kyla. I'll do a mini-album for those after the April pages. And oh! Gerry is in a short film for Plan International under the direction of Lem Garcellano. I'll probably do a mini-album for his pictures there... a no-frills album as usual.